Mennill, Daniel J.. "Black-capped Chickadee". The Canadian Encyclopedia, 23 May 2018, Historica Canada. https://www.thecanadianencyclopedia.ca/en/article/black-capped-chickadee. Accessed 24 April 2019. Black-capped Chickadees (Poecile atricapillus) live in woodlands across North America, and are regular visitors to backyard birdfeeders throughout Canada. Black-capped Chickadees (Poecile atricapillus) live in woodlands across North America, and are regular visitors to backyard birdfeeders throughout Canada. Both males and females show a black cap and bib, a bright white cheek patch, a light breast, and grey wings, tail and back. The Black-capped Chickadee measures about 13 cm from the tip of its beak to the tip of its tail. Black-capped chickadees are nonmigratory, surviving the cold winter in flocks of 4-12 birds. Flockmates forage together for insects, berries and seeds, and are often joined by other species including nuthatches, woodpeckers, Brown Creepers, Golden-crowned Kinglets, and Ruby-crowned Kinglets. Social relationships within these flocks follow a linear dominance hierarchy, where the high-ranking chickadees have preferential access to food and mates over low-ranking chickadees. When spring arrives, flocks break apart and birds begin to defend breeding territories. Breeding pairs use their small bills to excavate a nest cavity in softwood trees. They will also use birdhouses or existing cavities in hardwood trees. The female lines the nest cavity with soft plant material and animal fur. The female lays 6-8 eggs and incubates them for 12 days. Both parents feed the nestlings with insects and small caterpillars for 16 days, until the young are fledged and able to fly from the nest. Black-capped Chickadees produce a variety of calls and songs. Both sexes give the namesake "chick-a-dee-dee-dee" call. Slight variations in this call can convey different messages, such as where to find food or warning that a predator is near. Only males produce the two-note "fee-bee" song, usually during the breeding season. This song is important in defending a breeding territory against other males, and attracting female breeding partners. 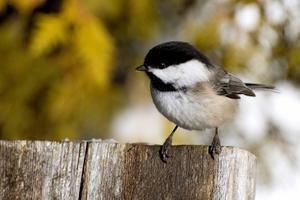 Chickadees have 14 more types of calls, each with its own function.